Z80 in a surface mount package, as found on some MVS and CD boards. 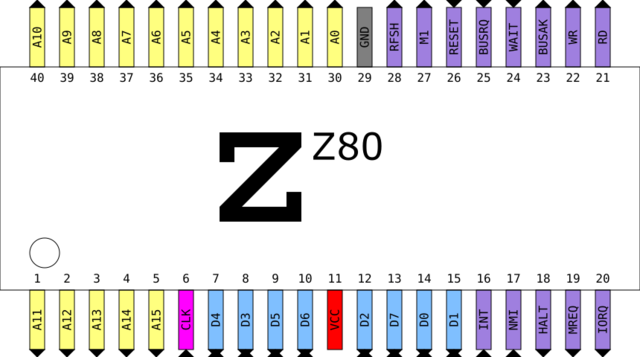 The Z80 is an 8-bit little-endian CPU designed by Zilog. All NeoGeo systems use it to handle sound and music playback. It runs at 4MHz and only has access to the YM2610, M1 ROM or Z80 files, and its own RAM. It communicates with the 68k CPU via a single-byte channel. Since it doesn't share a RAM area with the 68k CPU like on the Sega Genesis, it can't be used efficiently as an auxiliary CPU to perform gameplay or video related tasks. 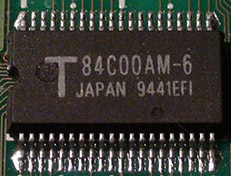 Z80 in DIP package, as found on AES boards. This page was last edited on 19 February 2019, at 20:22.